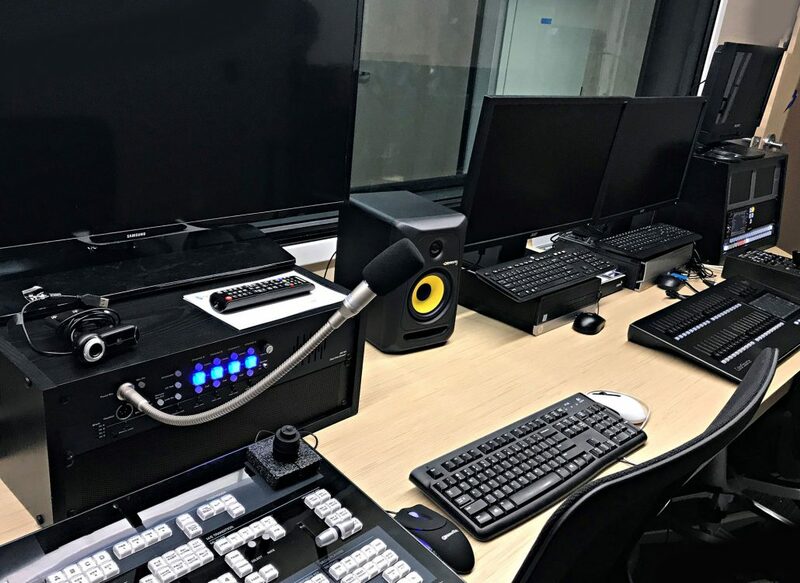 Midtown Video worked hand-in-hand with Citrix Technology Specialist Fabien Bourdon to design and build a new 4K-capable TV studio and control room for Citrix Corporation, in Ft. Lauderdale, Florida. With its innovative mission of empowerment, Citrix powers a better way to work by delivering the experience, security, and choices that people and organizations need to unlock innovation, engage customers, and be productive-anytime, anywhere. 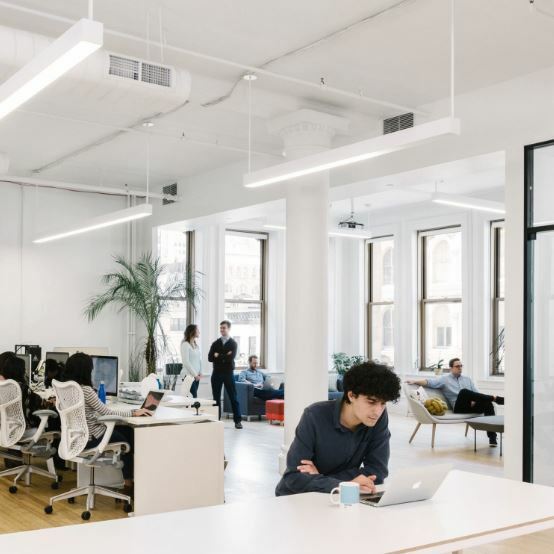 The company’s vision is that work is no longer a place, it’s an increasingly dynamic activity that people expect to be as adaptable as they are. Citrix powers digital workspaces that combine freedom and security, whether people are working on-site, on the road, or in the cloud. The new Citrix Studio is now producing a wide range of e-learning programs, training videos, and other corporate communications. Bourdon anticipates that the studio will produce hundreds of videos annually. Unlike the previous studio that Citrix used, which was a makeshift facility in a small, converted conference room, the new Citrix Studio and its adjacent control room are dedicated spaces on the second floor of one of the five buildings on the Citrix “Cypress Creek” corporate center campus. of services ranging from design, installation, systems integration, and training. They also worked with the architects at Global Architecture Projects, Inc., and building contractors, such as BluFin Construction, on matters involving air conditioning, in-wall conduits, flooring, soundproofing, outlets and other infrastructure to ensure a highly ergonomic studio environment. “To keep our productions visually fresh and dynamic, we wanted the ability to transform the look, color schemes, branding, visual displays and other set design elements on a regular basis,” said Bourdon. “Instead of physical sets, our studio features virtual sets keyed into an 18 x 18-foot green cyclorama, as well as an on-set videowall that can display any 4K imagery.” Midtown Video supervised the design and construction of the cyc, which was brought up via elevator to the second-floor studio in four pieces and then assembled in place. One corner of the studio also features a small talk show set with three 65-inch 4K LCD monitors mounted vertically on the wall. 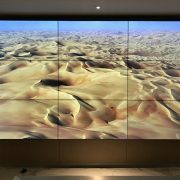 A Digi-Bird DB-VR C4H video processor helps configure the composition of the imagery across the multi-screen displays. In the middle of the studio, camera operators can freely move a Sony HXC FB 80 studio camera around the studio on pedestal. The color temperatures, hues and brightness of spotlights, key and fill lights on the overhead grid can be adjusted remotely from the adjacent control room using a DMX-compliant lighting controller. The control room is separated from the studio by a window consisting of two panes of glass 8-inches apart to dampen noise from that workspace. Inside the control room, an 18-foot custom console (by Whitlock Furniture) supports a NewTek TriCaster TC-1 4K/HD-SDI production switcher, and an Allen & Heath audio mixer. Midtown Video configured the Citrix Studio from August 2018 through early December 2018, culminating with personalized, hands-on equipment training of key Citrix staff. Throughout the planning stage, which actually began in 2016, Bourdon said that Midtown Video had remained flexible, patient, and involved as the company’s plans changed several times, including the site and layout of the studio. Citrix is powering a better way to work with unified workspace, networking, and analytics solutions that help organizations unlock innovation, engage customers, and boost productivity, without sacrificing security. With Citrix, users get a seamless work experience, and IT has a unified platform to secure, manage, and monitor diverse technologies in complex cloud environments. Citrix solutions are in use by more than 400,000 organizations, including 99 percent of the Fortune 100 and 98 percent of the Fortune 500. Learn more at www.citrix.com. 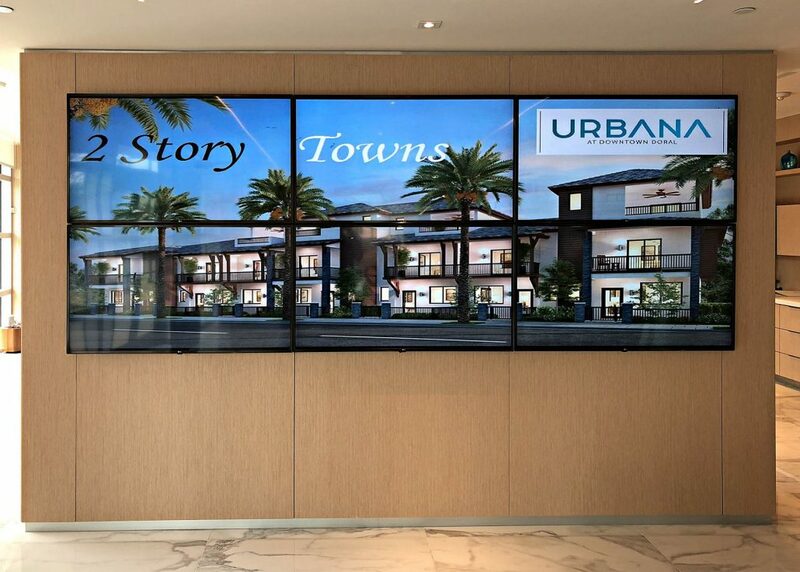 Urbana Real Estate Sales Center in Doral, FL recently upgraded their video wall. Midtown Video removed the existing system and replaced it with a completely up-to-date, thin bezel, connected experience. The technology update provided by Midtown Video includes a 3×3 Video Wall, using Samsung’s extremely thin (1.7mm) Bezel 55” Monitors. The system is controlled wirelessly using Crestron and the Client’s iPad. Video is distributed over IP using Crestron’s highly flexible NVX AV-over-IP solution. This combination allows the user to select between connected PC’s and wirelessly streamed sources to impress their clientele. Railroad transport leader CSX Transportation has long occupied one of downtown Jacksonville’s most distinctive high-rises, and conducts its most critical business—such as informing investment portfolio and fund managers of its quarterly earnings and media outreach—from executive suites and meeting rooms on the 15th floor. 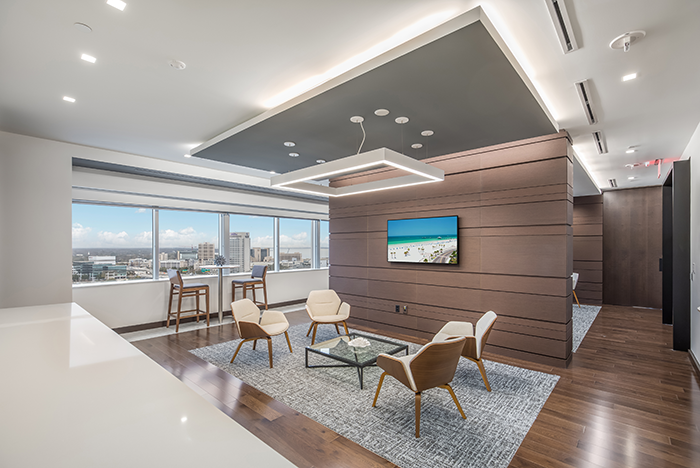 This floor, including the executive boardroom, committee meeting room, and vestibule/lounge area, was fully renovated by Gresham, Smith & Partners. 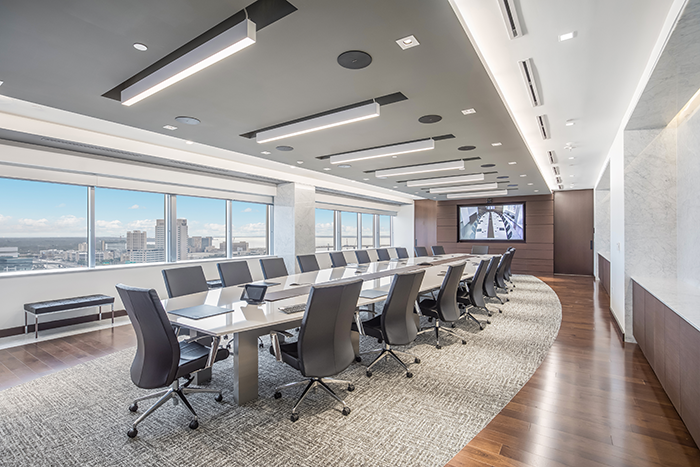 To ensure an optimal, ergonomic video conferencing and meeting experience, this architectural firm brought Midtown Video, a Miami-based A/V systems integration company into the project to install customized video conferencing and meeting control systems. “Since the CSX project involved so many systems that needed to be controlled, I chose Crestron for control and Panasonic for displays because both companies dominate the market with reliable, compatible products while offering excellent local support,” said Carl VanOrmer, a systems integrator who runs Midtown Video’s Northern Florida operation. Logistical challenges at CSX included coordinating the many vendor deliveries and multi-phased installation around the construction. While waiting for meetings to begin, attendees pass the time in the vestibule/lobby area, where they can watch TV—including satellite TV channels, DVDs, and/or Apple TV—on two Panasonic 55-inch flat-screen displays, and eat food served in the nearby kitchen. When no video program is selected, Apple TV shows beauty shots as screen savers. For private meetings and negotiations, the adjacent committee room accommodates eight people, and features a Lifesize Icon 600 video conferencing system, three Panasonic 55-inch flat-screen displays, and Crestron A/V systems control. 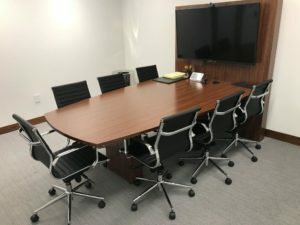 The executive boardroom features a massive conference table—designed and built by Antique and Modern Cabinets, Inc. of Jacksonville—that seats 21 people, and two Panasonic 98-inch 4K/UHD wall-mounted flat-screens. Powering the room are a Crestron 3-Series 4K Digital Media Presentation System 300, Lifesize Icon 800 Video/Audio conferencing system, and two Lifesize camera 10X systems that provide different perspectives of the room. A/V equipment, such as a Crestron 8 x 8 digital media switcher, is stored in racks in the nearby IT closet. Crestron 10.1” and 8.7” wired and wireless touch-screens enable meeting hosts to remotely control the sound, lights, and window shades. With custom programming and graphics, the control panels allow users to select media sources for display, like satellite TV, DVD players, and Apple TV, as well as multiple PCs, laptops and mobile devices. In the boardroom, an equipment trough runs the length of the conference table, so control equipment can be hidden away, including mobile device charging stations and table boxes for plugging in computer devices. While VGA with audio, HDMI, USB, Ethernet and AC power connections are supported, a Barco Click Share system allows people to plug a device into their USB that allows them to direct their screen output to the big-screen displays, and switch between computers, with push-button ease. At the heart of each room is a Crestron Avia 12×8 DSP with Dante audio/IP networking, USB Audio, AEC and audio conferencing interface, and a Crestron 8-channel (75W per channel) power amplifier. “The most complex part of this installation was the digital signal processing (DSP) associated with the audio system,” VanOrmer said. 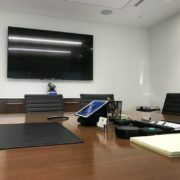 Whenever anyone enters the executive boardroom, the CSX logo, or guest companies’ logos—on Crestron Digital Graphics Engines 200—automatically appear full-screen on the displays. And if room sensors don’t detect motion for 30 minutes, it assumes everyone has left and shuts the equipment off to conserve its useful life. 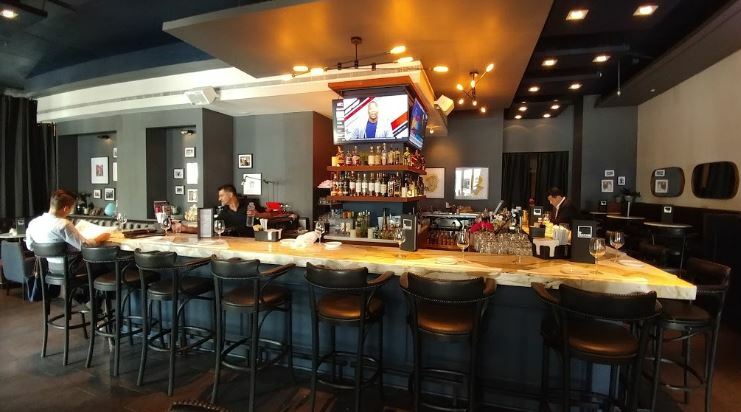 Opened by the creators of Town Kitchen & Bar in South Miami, HOUSE Bar & Restaurant is located in the Colonnade Hotel in the heart of Coral Gables. The restaurant inherited a great space as well as some sound equipment. The restaurant has four separate zones each with a distinct purpose: a bar/DJ booth, a dining room, a private event room, and an outdoor area. 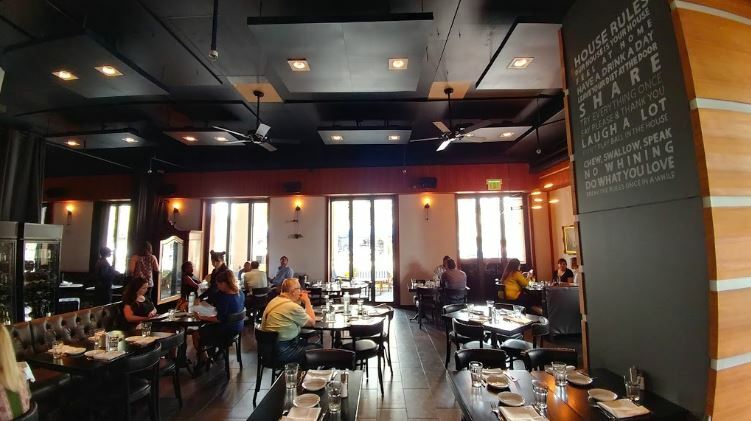 HOUSE’s goal was to have the ability to give guests a different vibe in each of the restaurant’s four zones and to control all of the audio and visual from one source. In the bar, Midtown Video connected the DJ booth to the audio infrastructure and mounted two 49” monitors. Two more 49” monitors were mounted in the outside area. That part was pretty straightforward. The main challenge was the private event room. HOUSE Kitchen & Bar wanted their private event room to be multipurpose, so it could accommodate, say, a corporate business presentation luncheon as well as an anniversary party. The order here was for Midtown Video to configure the room with an audio and video system that was user-friendly and could appear and disappear as needed. To control the AV system, Midtown Video provided a Key Digital 8×8 HDMI Matrix switcher and a Crestron 12/x Audio DSP, which routes all video and audio sources to the zone of their choosing. Video sources include four cable boxes, a laptop, and a USB drive for the projector, and whatever customers bring to the table. Any of these sources can be played on any of the video displays. Also, any audio source (Pandora, Cable Boxes, Laptop Plate, DJ booth, or 3.5mm jack for iPhone) can be played in any of the four speaker zones throughout the restaurant. Now, HOUSE Kitchen & Bar can set a different mood and tone in each zone. Management has the flexibility to turn on a Heat game by the bar while the DJ spins music and play jazz music in the dining area, while a private event looks at a slideshow or boogies on down at a disco party…all from the touch of an iPad. 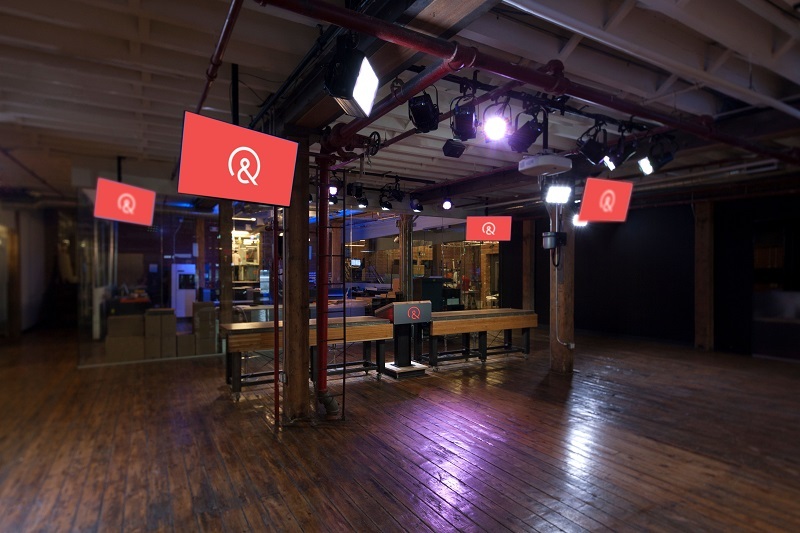 With offices in NYC, LA, San Francisco, and Chicago, Managed by Q wanted a partner to help them turn a multipurpose space in their NYC office into a room equipped for video conferencing and all-hands-on-deck meetings that could be streamed from New York to their other locations. Video conferencing is a great tool for geographically-diverse companies to keep the lines of communication flowing between offices thousands of miles apart. 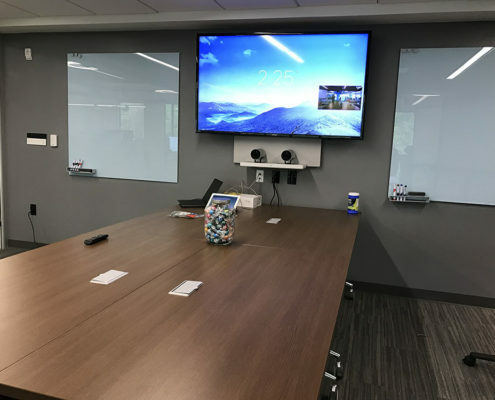 The only caveat and challenge in this case was that the multipurpose room remain multipurpose, so it could transform from a video conferencing room into a room suitable for lunch presentations or group meditation or other activities. Our biggest challenge was creating a solution that would fit Managed by Q’s unique mobile needs. 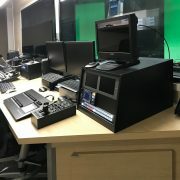 To make this happen, Midtown Video designed a break-away system that fit neatly into two mobile carts and a custom patch panel so the carts could easily be connected to speakers and video connections. Each cart contains rack equipment as well as a ClearOne Unite 200 camera and a 70-inch display monitor. In addition, two Audio Technica wireless lavalier microphones and two wireless handheld mics were provided for amplifying the sound within the room and to reach audiences through the video conference. Audio reinforcement was provided with six JBL Straight Line Array Column speakers and two Crown Amplifiers. Lastly, Midtown Video provided a camera for the CEO of Managed by Q so he can record company-wide addresses from his office, as well as a Matrox Monarch Lecture Capture Device to enable on-demand viewing. GE Digital is living up to their name. 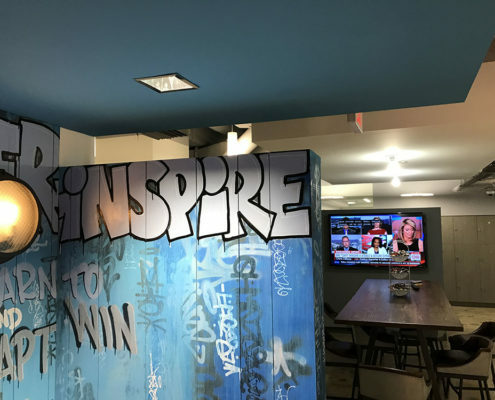 As they moved into sleek new offices in Coconut Grove, FL to expand their Industrial Internet of Things services to worldwide customers, Midtown Video was hired to seamlessly connect audio-video collaborative systems in 9 work spaces. Begin your visit with smart digital signage as you enter the reception area. Then meet your contact in one of four conference rooms equipped with large screen displays; Cisco SX 80 video conferencing codec and cameras; and ceiling mounted mics and speakers. 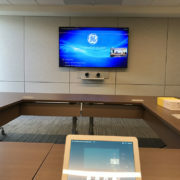 Two of the rooms have the Cisco TelePresence SpeakerTrack 60, an unparalleled dual-camera system that can track and zoom-in on a speaking participant in real time. This provides a life-like experience, the next best thing to being physically present. In any one of these meeting rooms you can connect with colleagues next door or across the globe and have a face to face discussion, virtually speaking. Lunch time – have a bite to eat in the work-café or breakroom and share your meeting notes using the Barco ClickShare wireless system and wall mounted screens. It allows you to share your laptop or mobile device on a main presentation screen, no cables necessary. 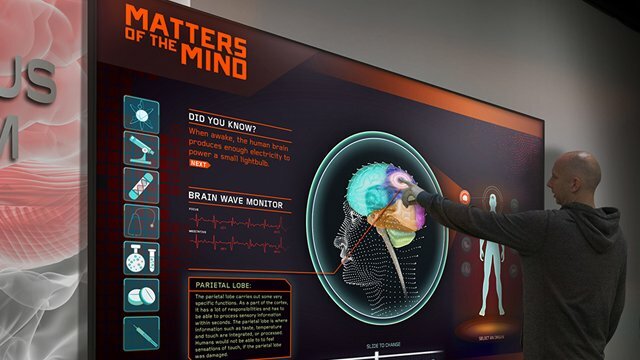 More meetings after lunch followed by cybernetic excitement in the gaming suite where two X-Boxes and extra-large monitors help you process, compete, and refresh. A little “fun” break to encourage the team. Working closely with Blue Wave Communications cabling contractors, Midtown Video was able to deliver all systems on time and in budget. Kobre & Kim, the go-to intercontinental law firm specializing in disputes and investigations, faces unique challenges in coordinating resources from multiple global offices. 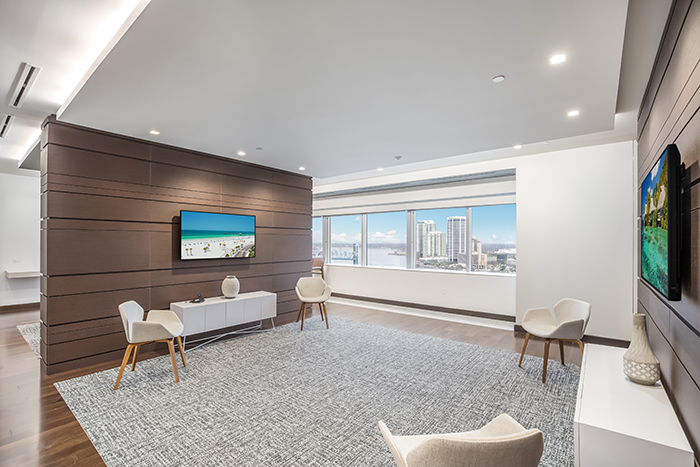 IT Analyst Cardell Graham enlisted Midtown Video to build three dedicated video teleconferencing boardrooms on the 19th floor of their downtown Miami offices. The goal was to create an atmosphere where international attorneys and staff could share information efficiently. Early in the integration process, Midtown Video’s technical team realized that preserving and featuring the esthetics of the workspace was as critical to the success of the project as providing state of the art technology. 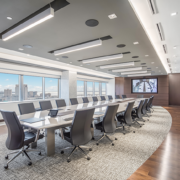 In the largest 24- seat conference room, the user-friendly Crestron 3-Series processor drives the system. A Sony 4K Ultra HD large screen display and Lifesize video processors and cameras provide high quality video imaging. Using Clearone Beamformer microphones insure clear audio from anywhere in the room. Similar solutions are installed in two smaller “war” rooms for meetings and depositions. The offices are now staged for on camera consultations with no room for imperfection in the elegant workplace nor glitches in the video conferencing exchange. With offices throughout the Americas, Europe, the Middle East, Asia and the Caribbean, collaboration is a breeze and travel not required. Lennar, headquartered in Florida, is one of the nation’s leading homebuilders with communities in eighteen U.S. markets. With such a large footprint, having a top tier conferencing suite was in order. We’ve worked with Lennar many times in the past, including installing video monitoring in their Network Operations Center. So when they were ready to upgrade their teleconferencing and collaborationabilities, they called us. The newly renovated wing of Lennar corporate headquarters has a suite of four conference rooms. Account executive Chari Hill toured the offices with Charles Jewett, I.S. Manager to map out the upgrade strategy including equipment needed, room design and installation requirements. 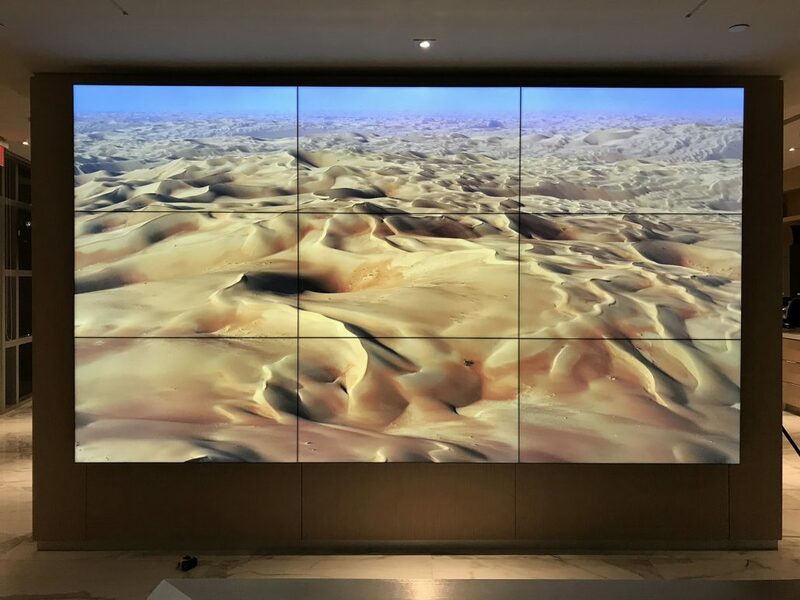 The result was a state-of-the-art conference center with a 98” Planar LED-backlit flat panel display with four times the resolution and pixel density of comparably sized full HD displays and interactive capability . That means no detail is missed. 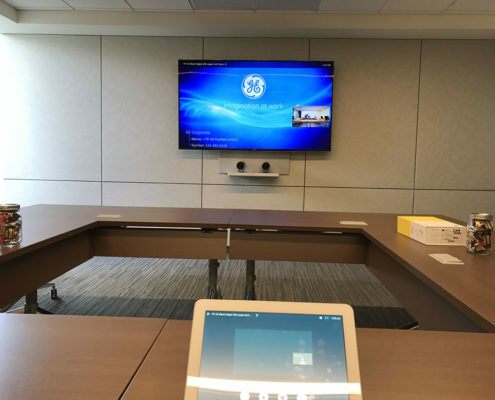 A Crestron digital media system enhanced with Cisco teleconference and collaboration tools delivers unrivaled meeting abilities. System Designer and Project Manager Jesse Miller once again made sure expectations were exceeded. 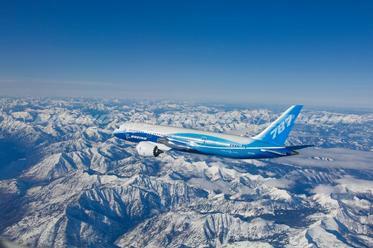 In 2013, Boeing unveiled its Dreamliner 787 fleet. The new aircraft seats up to 290 passengers and has a host of new features including using 20% less fuel than other airplanes of its size. Boeing is building 10 Dreamliners a month, and has increased its production rate three times in just over a year. In 2013, Boeing unveiled its Dreamliner 787 fleet. The new aircraft seats up to 290 passengers and has a host of new features including using 20% less fuel than other airplanes of its size. Boeing is building 10 Dreamliners a month, and has increased its production rate three times in just over a year. The Dreamliners are assembled in Everett, Washington and North Charleston, South Carolina. Pilots and mechanics for the new planes are trained at the Boeing Flight Services Center’s Miami campus, Boeing’s largest training facility. This 134,000 square foot facility is the model training campus for Boeing in the Americas. 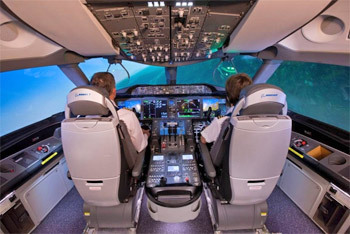 The 787 training suites will be as ground-breaking as the aircraft complete with full flight simulators. CRESTON® 3-Series Control System ® with infiNET EX® wireless technology featuring the 3-Series® control engine. Fiber optic IO cards enable the system to take advantage of fiber optic cabling. The MC3 networks, manages and controls technology in fundamentally new ways and made it possible to integrate all of the disparate technologies throughout the facility. CRESTRON® Digital Media MD8x8 switcher provided the foundation for a complete system delivering true high-definition multi-room AV signal routing. This is the first truly complete HD audio visual distribution system, and takes HDMI to a higher level than ever before. The system was programmed to interface with all Boeing’s training components for a complete high-end integrated solution. Sony HD projectors, JBL speakers and other accessories completed this sophisticated installation. Quirky is an online invention platform that connects major corporations with great ideas from a community of over one million inventors. Video is a big part of that interaction, both as a tool for their inventors to show their ideas and for the company to illustrate its process. Every week, Quirky live streams new products in the pipeline and offers a chance to evaluate them in real time. An 8-person panel and a studio audience of 100+ with 20,000 more watching online help decide which ideas becomes a reality. And that’s where Midtown comes in. Quirky visionary Josh Wright asked us to visit in New York to discuss setting up the new studio. 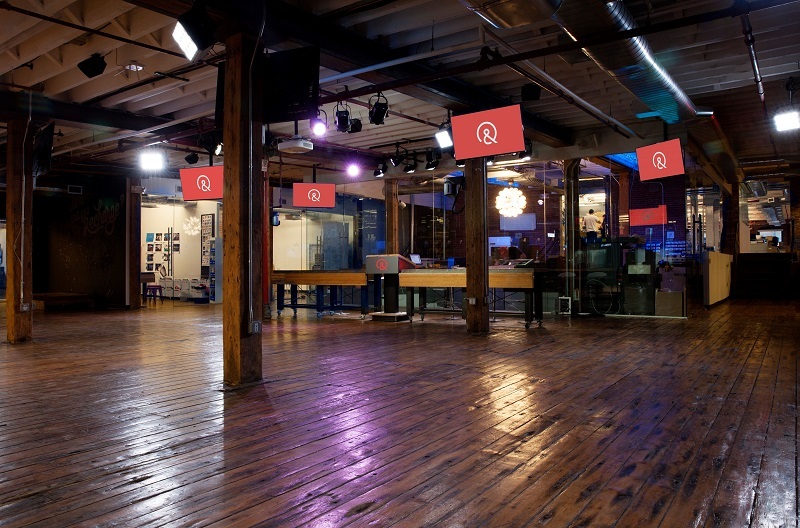 Midtown Video provided 8 cameras, lighting, audio, and live streaming capability for the Quirky television studio. The Quirky group liked what Jesse Miller, System Designer and Project Manager, had in mind. 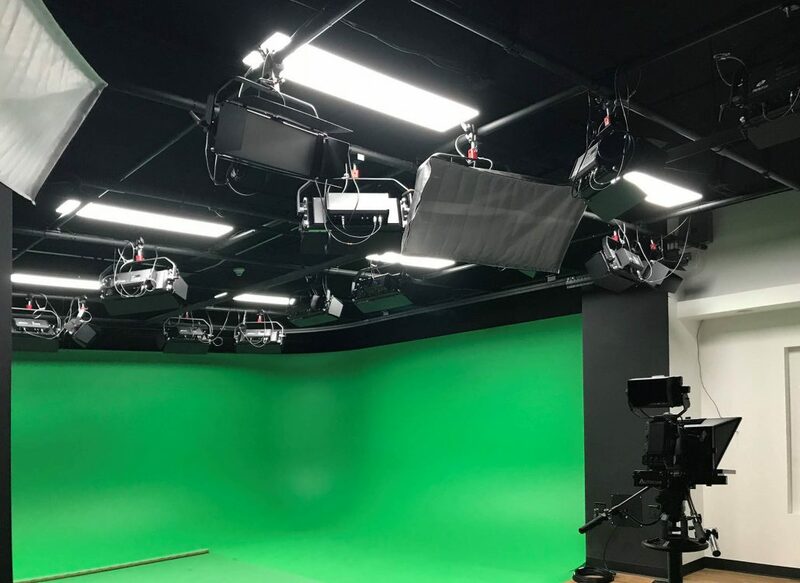 The Midtown team was called in to build the eight-camera production studio taking into consideration audio, lighting and cameras. Putting on a live show means no margin for error, and live remote interviews add their own challenges. No worries, our streamlined process and experienced team assured a mistake-proof project. 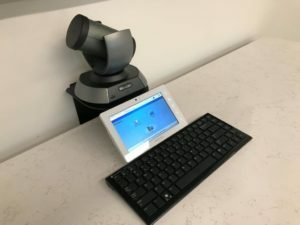 The installation included robotic cameras, in-dash studio wireless cameras, remote wireless bonded cellular cameras and remote interview systems. Josh proclaimed us “amazing” and added “We love Midtown”. The feeling is mutual! This was a challenging and fun project, and we can enjoy the results every Wednesday night when the show streams.